Schematic procedure for the MethylFlash™ 5-mC RNA Methylation ELISA Easy Kit (Fluorometric). 5-methylcytosine (5-mC) in DNA occurs by the covalent addition of a methyl group at the 5-carbon of the cytosine ring by DNA methyltransferases. This process has been well studied and is generally associated with repression of gene expression. It was also observed that in humans, 5-mC occurs in various RNA molecules including tRNAs, rRNAs, mRNAs and non-coding RNAs (ncRNAs). 5-mC seems to be enriched in some classes of ncRNA, but relatively depleted in mRNAs. Levels of 5-mC are variable in animal genomes, ranging from undetectable amounts in some insects to about 0.1-0.45% of total RNA in human cells. The majority (83%) of 5-mC sites were found in mRNAs. Within these transcripts 5-mC appears to be depleted within protein coding sequences but enriched in 5’ and 3’ UTRs. Two different methyltransferases, NSUN2 and Dnmt2 are known to catalyze 5-mC modification in eukaryotic RNA. There has been strong evidence that RNA cytosine methylation affects the regulation of various biological processes such as RNA stability and mRNA translation. Furthermore, loss of 5-mC in vault RNAs causes aberrant processing into Argonaute-associated small RNA fragments that can function as microRNAs. Thus, impaired processing of vault ncRNA may contribute to the etiology of human disorders related to NSun2-defciency. This kit contains all reagents necessary for the quantification of global 5-mC RNA methylation. In the assay, RNA is bound to strip-wells that are specifically treated to have a high nucleic acid affinity. 5-mC in RNA is detected using capture and detection antibodies and then quantified fluorometrically by reading the fluorescence in a microplate spectrophotometer. 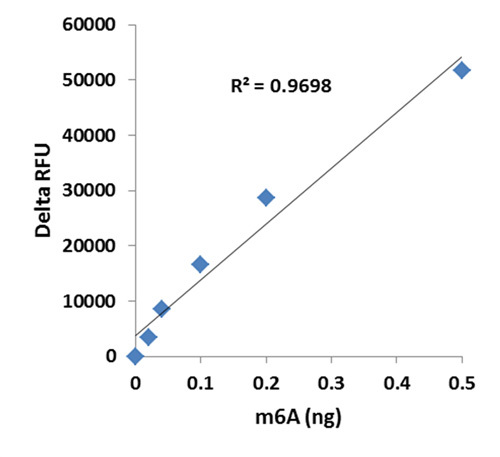 The percentage of 5-mC RNA is proportional to the fluorescence intensity measured. Input RNA should be highly pure with 260/280 ratio >2.0 and relatively free of DNA. DNase I can be used to remove DNA. RNA should be eluted in RNase-free water. The RNA amount can range from 50 ng to 300 ng per reaction. However, we recommend using 200 ng of RNA, which is the optimized input amount for the best results.